The community's pooches are getting top training thanks to the kind hearts of the Police Dog Unit's instructors. Five PDU officers have been offering their spare time to provide obedience training to civilian dogs through a programme jointly organised with the Society for the Prevention of Cruelty to Animals. Over 100 canines have graduated in the two sessions held so far, which have not only made them more responsive to their owners but also safer to take out in public. The six-session courses, held consecutive Saturdays on the mammoth football pitches at Queen's Hill Camp, were conducted late last year and in April. Taking a break for the hot summer months, the courses are set to resume in late September due to their huge popularity which has so far seen about 50 to 60 dogs enrolled in each. PDU Chief Inspector Charles Kong said the Unit was approached by the SPCA as it was hard to find professional dog trainers in Hong Kong. The courses were free and no money was generated by the officers or the SPCA. 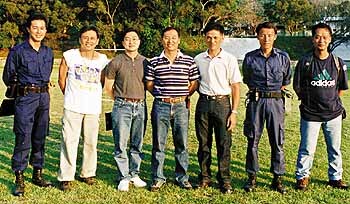 "Another Police dog handler also volunteered his services along with a civilian, a senior member of the Hong Kong Kennel Club, bringing us seven instructors in total, all conducting the sessions in their own time," CIP Kong said. "People have to pay a hefty charge for professional dog trainers in Hong Kong - there aren't many. But this course is basically a community service which not only assists a charity, it also boosts the image of Police and the Unit showing we do have a friendly, human and benevolent side. There is a lot of self satisfaction in it for the trainers too - there's nothing quite like seeing your students up there on graduation day. SPCA Public Relations and Communications Senior Manager Amy Chow Tak-sum said feedback from its members was "great" and there was demand for further courses. "For the two courses held so far we received hundreds and hundreds of applications but with a limited number of trainers we have to limit the number of dogs. "But during the course you could see a dramatic change in the dogs' behaviour with the restless ones soon becoming very disciplined. The owners were extremely pleased as some could not even take their dogs out before. The course actually trained the owners to train the dogs themselves which really helped develop a solid bond between them." Ms Chow said many people had the misconception that hitting a dog would help train it. "Proper training and encouragement is what PDU use on their dogs and this course proves it works," she said. "We thank PDU very much for helping us as without the volunteers, we may not be able to help the owners and that could lead to these dogs being abandoned and left on our doorstep looking for homes."